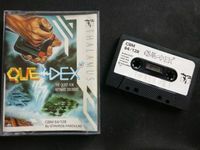 Thalamus' third game for the Commodore 64, Quedex was short for "The Quest for ultimate Dexterity", and was designed and programmed by Stavros Fasoulas. It was essentially a platform/puzzle game seen from above – the player had to guide a metallic sphere through a number of stages of different nature. Some were about being quick, some about clicking the right buttons in the right order, some about not falling down the holes in the stages. The music for the C64 was composed by Matt Gray. The Amiga, Atari ST and DOS releases were named "MindRoll", where the metallic sphere was replaced by an eyeball.